Brother Mack is a strong believer in the power of prayer. It would be his pleasure to offer personalized prayer services depending on your need. Some people have expressed concern that prayer services are only offered for a fee. Brother Mack has chosen to charge a small fee for this service to stop some of the "non-believing" time wasters using his prayer for their own twisted gratification. Brother Mack, at his sole discretion, may choose to offer some	services at a reduced fee for the truly needy. Please contact Brother Mack if you feel these special circumstances may apply to you. Brother Mack's time is very valuable and these types of requests will only be considered for the truly needy! Brother Mack will pray for you during one of his general prayer videos. Request this service for yourself, a loved one, or a sick family pet! On the next page please supply your Name, Town and any extra details you think are important in the prayer in the "Add special instructions to merchant" box. Brother Mack will pray for you in a personalized five minute prayer video. This may be your best option if you have sinned a medium to large amount. You will be contacted by email by Brother Mack or Brother Producer for the fullest of personal prayer requests. With your input, Brother Mack will write and perform a prayer for you in the form of a music video. This is perhaps the most expressive way to show your love for God. 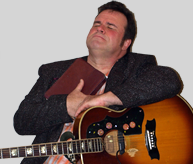 Brother Mack loves to perform and would love to help you give your life to God! Some quick terms. Services will take a little time to produce, typical lead time is under 2 weeks. Starter services may take a little longer as multiple prayers are recorded to the same video. Song writing may take longer, as it is a collaborative process. This website and its content is copyright of Mack Stevens - � Mack Stevens 2010. All rights reserved. Not that anyone will listen. Technically this notice doesn't even need to be here. It takes up a nice amount of space though.